In reaction to the UAE government recently revising fuel subsidies, industry experts have urged motorists to adopt fuel-efficient vehicles to save on petrol costs and support the UAE’s sustainable transportation agenda. The UAE Ministry of Energy, Adnoc and Enoc have coordinated on revising transport fuel subsidies, by aligning petrol and diesel prices monthly to global price indices and operating costs, according to Fitch Ratings, which predicts that fellow GCC countries could join the UAE in reforming energy subsidies. Meeting the growing demand for fuel efficient vehicles in the region, and supporting the UAE’s sustainability agendas with UAE Vision 2021 and Abu Dhabi Vision 2030, the World Future Energy Summit (WFES) 2016, hosted by Masdar and part of Abu Dhabi Sustainability Week, will launch a new dedicated area “WFES Sustainable Transport”. At WFES Sustainable Transport, manufacturers and innovators will showcase sustainable transportation technology across land, sea, and air; complemented by conference proceedings featuring global thought leaders on sustainable transportation. “Revising fuel subsidies in the UAE is already leading to higher prices at the pump, boosting demand from motorists, educational institutions, organisations and mass transit authorities to rapidly adopt the latest fuel efficient hybrid vehicles,” says Naji El Haddad, group event director, WFES 2016. “The UAE is set a regional trendsetter in reforming fuel subsidies and supporting national sustainability agendas. In turn, the UAE is primed to quickly become a fast-growing market for hybrid and electric vehicle manufacturers,” adds El Haddad. Demonstrating the potential for fuel efficient vehicles, the UAE has one of the fastest-growing automobile markets in the region, with the country’s automotive sales growing by 6.5 per cent from H1 2013 to H1 2014, and 75 per cent of consumers planning to buy a car in the next two years, according to a recent report by Emirates NBD. 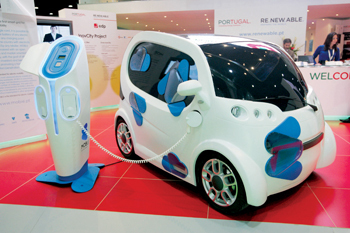 In previous years, leading fuel efficient vehicle manufacturers Renault Group, Nissan Group, Mercedes-Benz, and Porsche, along with Portugal’s MOBI.E electromobility charging system, have participated in WFES, showcasing vehicles such as the all-electric Nissan Leaf and the high-efficiency diesel-powered Renault Clio.